Although more than 250 Fw 190s served in North Africa between November 1942 and the Axis surrender there on 13 May 1943, only a handful of them received 'desert' camouflage colours. In fact, most of the Luftwaffe Fw 190s that served in Tunisia wore the standard European 'grey' scheme of RLM 74/75/76. The 'desert' colour used in Tunisia was RLM 79 Sandgelb, and perhaps the most famous Fw 190 in a desert scheme was Focke-Wulf 190 A-4 Werknummer 748, coded 'Yellow 1 + -' and flown by Experte Oberleutnant Erich Rudorffer, who had claimed 222 aerial victories by the end of the war. Klaus Jostsurvived his one-legged mission on 10 August, but his luck would soon run out. He was shot down by American Spitfires on the very next day, and spent the remainder of the war as a prisoner in the United States. II./SKG 10 AIRCRAFT, CAMOUFLAGE AND MARKINGS Because of the difficult situation that II./SKG 10 found itself in – with newly arrived Fw 190s immediately committed to operations, and quickly lost or recorded off strength – its aircraft were not given unit emblems, fuselage codes or terrain specific camouflage, which generally made them quite anonymous in appearance. Rather than fuselage codes, aircraft retained their four-letter factory codes (Stammkennzeichen) on either side of the fuselage cross as a means of identification. A factory-applied white fuselage band was carried, to distinguish them as Mediterraneanbased aircraft, and the lower engine cowling was painted yellow. At least three Fw 190 A-5/U8's of II./SKG 10 marked with Stammkennzeichen on the fuselage sides carried a large number painted on the rudder and tail, which was presumably an individual aircraft code (examples include Green 5 and White 10). Allied landings at Augusta 10th Aug 1943. This image and below: Fw 190 A-5/U8 of II./SKG 10 at Crotone in August 1943. This aircraft has the Focke-Wulf designed under wing racks. Note the absence of outer wing cannon, and the yellow lower engine cowling. Photo's 01-02: One of the last daylight fighter bomber raids on England's South Coast took place on the late morning of 4 June 1943 when 18 Fw 190s crossed the coast at Beachy Read at zero feet and turned to drop a total of 13 SC 500 bombs on Eastbourne. One of the attacking aircraft was flown by Hevler of IV./SKG10, whose aircraft, W.Nr 51353, was hit by light anti aircraft fire. Kurt Hevler attempted to make a forced landing but crashed at Norman's Bay, Bexhill. These photographs show Allied troops inspecting the remains of the machine. Photo's 01: This aircraft was not operated by I./SKG10 but is externally almost identical and is included here to provide an impression of an aircraft starting-up for a night mission. Flying the single-engined, single-seat Fw 190 bomber over England at night was difficult and dangerous enough without the additional hazards of the often cruel weather and a determined enemy. By the time I./SKG10 began night operations in the Spring of 1943, Britain's night defences were formidable and included a night-fighter force flying radar-equipped Beaufighters and Mosquitoes which accounted for many of I./SKG10's losses. One of the RAF's most famous night-fighter pilots, the then F/Lt. JRD 'Bob' Braham, once confessed to his Intelligence Officer that he had a sneaking regard for the nameless and often brave Luftwaffe airmen whom he was killing. Photo 01: Although the unit to which this Fw 190 belonged has not yet been positively identified, the small identification number on the fuselage has lead to speculation that it may have belonged to SKG10. The bomb rack beneath the fuselage certainly adds weight to this theory. Photo's 01-02: Fw 190A-5/U-8 of the I./SKG10 in 1943. Note that the drop tanks are mounted on Messerschmitt racks which offered less wind resistance than the original Junkers designed racks which were enclosed in large fairings. The Fw 190's of I./SKG10 frequently had the cowling guns removed and were provided with wide head armour. Nice color photo of Focke-Wulf Fw 190G3 DN+FV WNr 160022 Germany ? late 1943 ? Focke Wulf 190-A8 II. (Sturm) 'Fratz III' 5./JG4 'Weisse 16 ' 1944 Pilot: Oberfahnrich (Warrant Officer) Franz Schaar (3 Air Victories) on September 27, 1944. The Fw 190 fighter-bomber force available to counter the Allied invasion of Sicily comprised two units, Schnellkampfgeschwader 10 (SKG 10) and Schlachtgeschwader 2 (Sch.G. 2), which were both exhausted and badly in need of rest, replacement pilots and new aircraft. They had fought hard in the final stages of the North African campaign, but in the early days of May 1943 had to hastily evacuate their African bases and fly more than 170 km across the Mediterranean to airfields in southern Sicily, often with several 'passengers' – mechanics and other members of the unit's ground personnel – hastily stowed in the fuselages of their Fw 190s. Some pilots bravely flew several of these very risky evacuation flights. It was from one of the Gerbini satellite airfields, known as Marsa del Oro, that the first III./SKG 10 mission of the day began. Leading the pair of Fw 190 A-5s on this hit-and-run raid was Oberleutnant Ottmar Simon, a veteran of the unit who had previously served in Russia, France and Tunisia. Accompanying him was rookie 19-year old Oberfähnrich Horst Kulpa, who had flown his first combat mission barely a month earlier, on 6 June. This same pair had sunk an American ship during a mission to the Allied beachhead on the previous day, and fortune was to favour them again on the eleventh. Oberleutnant Simon and Oberfähnrich Kulpa intended to attack shipping in the vicinity of Gela and Licata, where the American 1st and 3rd Infantry Divisions had landed. Ottmar Simon and Horst Kulpa were met by anti-aircraft fire of all calibres near the coast, and dodged barrage balloons near the beaches, before they commenced their bombing runs. Of the numerous targets available, they picked out two medium-sized ships lying side-by-side east of Licata, unloading on the beach. They carried out a shallow dive-attack, strafing as they neared their objective. Oberleutnant Simon's bomb hit one of the 4,000-ton cargo vessels amidships, and he was later officially credited by the Luftwaffe with the sinking of this ship. In contrast, Horst Kulpa's bomb was reported to have caused no damage. The pair then dashed for home at high speed, and landed at Marsa del Oro just 25 minutes after taking off. Oberfähnrich Kulpa made it back to base despite slight wounds sustained from a hit by light anti-aircraft fire over the invasion area. Four Lockheed P-38s were spotted over the target, providing additional cover for the newly created beachhead, but the dangerous twin-engined American fighters failed to engage the fast, lowflying Focke-Wulf 190s. Although the Luftwaffe achieved some notable successes, such as the sinking of LST-158, and the U.S. Navy was very concerned about the Axis air threat, the Germans and Italians lacked the air resources to stop the Allied invasion on the beaches, or seriously disrupt the subsequent build-up of British and American forces in the beachhead. The Fw 190 certainly proved its worth as an anti-invasion weapon, but as one of the participating German pilots remarked after the war: '… our operations enjoyed success, but these were only pin-pricks in view of the enemy's overwhelming superiority.' The battle for Sicily would continue for another five weeks, and the Fw 190 would continue to play an important part. 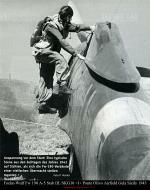 The hasty Fw 190 evacuation resulted in a very difficult couple of weeks for SKG 10 and Sch.G. 2, as they attempted to establish themselves on several hurriedly prepared bases. Although the Fw 190 units had only a small number of serviceable aircraft available, they were expected by Luftwaffe commanders to quickly resume regular missions. However, they faced numerous problems, the most serious of which was the frequent Allied bombing raids on the handful of airfields available to them. To compound matters, the inadequate road and rail network in southern Italy hindered the flow of vital supplies such as jettisonable fuel tanks and bombs, further delaying the resumption of SKG 10 and Sch.G. 2 operations. This was a very frustrating period for Fw 190 units and the Luftwaffe leadership in the Mediterranean theatre, and it was not until 20 July that SKG 10 returned to action. Even then it was on a very small scale, with missions up to the end of the month involving no more than nine aircraft. 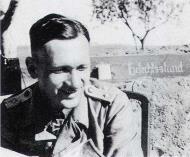 With all other German and Italian groundattack units withdrawn from the combat zone by the end of July 1943, the burden of flying daytime army support missions over Sicily fell entirely on a single Fw 190-equipped Gruppe, II./SKG 10, under the command of a Knight's Cross holder and former Zerstörer pilot, Hauptmann Helmut Viedebantt. Crotone near the toe of Italy was chosen as II./SKG 10's main operational base, and because of the distance from Crotone to targets in Sicily, the Gruppe used a special Fw 190 variant that could be equipped with two underwing drop tanks: the Fw 190 A-5/ U8, known as the Jabo/Rei. As one of them later recalled: 'The colourful tracers and the black smoke balls of their 10.5 cm anti-aircraft guns in between offered a delightful sight – and we had to get through.' II./SKG 10 attacked the harbour around an hour after taking off, and claimed a good deal of success against Allied shipping. One bomb was reported to have fallen three metres from the stern of a cruiser, Oberleutnant Ernst Henkelmann claimed a hit on a destroyer, resulting in a column of smoke, and II./SKG 10 pilots believed that they saw a hit on a small coastal merchant vessel. Despite these German claims, there are no Allied reports of any vessels damaged or sunk in this raid, although one bomb did fall between two ships. He did not do it, and asked instead if both of his auxiliary tanks were gone. His machine yawed. I told him immediately that his tanks were gone, and said again: 'Go to formation flight distance, now!' He still didn't do it. A few seconds later, there were flashes in his cockpit – he turned to the right and was soon down in the water. A Spitfire raced alongside me and pulled away to the right. I also changed course to the right and pursued him, firing a burst. Once back at Crotone, I reported, 'Uffz. Woltering shot down by a Spitfire', and it was received without comment. But Lt. Walter – an officer who did not have any authority over me but who expected to be addressed in third person, even though he was not a Staffelführer – this man deemed it necessary to blame me bitterly for flying the mission with the half retracted undercarriage. He thought that the undercarriage could have been bent in the dive and I could have fallen flat on my face on landing. He gave his opinion to the Kommandeur with an arrogant twitching of his mouth. Nobody talked about how unpleasant it was to fly with one leg out.' Klaus Jost survived his one-legged mission on 10 August, but his luck would soon run out. He was shot down by American Spitfires on the very next day, and spent the remainder of the war as a prisoner in the United States. Remarks:KIA 4 June, 1943 after being hit by flak; attempted a force landing and crashed at Normans Bay, Bexhill, Sussex; buried Cannock Chase, Block 4, Gr 183 (M.Croft). One known victory, his 1st, a Fokker XXI over De Kool, 10 May, 1940. Remarks:MIA 11 August, 1943 north of Orlando, cause unknown. Remarks:English POW at wars end in Flensburg. Flew over 300 combat missions. Although born in NY, in his youth, he made his home in Friedrichshafen, in southern Germany. His first mission was over southern England in June, 1943. In July, 1943, the Group transferred to Sicily. Injured in a crash in October, 1943. After recuperationg, he was assigned to NSG-4 in November, 1943, at Kiew, where he flew night and day missions. Wounded a 2nd time in March, 1944. After recuperating, assigned to SG-104 at Tutow-Aalborg. October 1944, assigned to I/SG-151 and later to III/SG-1(4/45) in defense of the Reich (Berlin). One known victory in SG-1, a Soviet La-5 on 27 April, 1945. Alternate spelling: Wenke (OKL 4/45 victory). Living in Lindau on the Bodensee in 2003. Jager Blatt 4/2003. Remarks:His first known victory, a Spitfire west of Pozzaglia/Sabino Italy on 6 November, 1943. His 2nd, a Spitfire east of Castelfrantano Italy on 28 November, 1943. His 3rd, a Spitfire IX south of Ragino Italy on 8 December, 1943. His 4th, a Soviet LaGG-9 on 24 July, 1944. Alternate spelling: Rischbinter and Rischbucher. Jager Blatt, Deceased 12 January, 1996. Remarks:WIA 5 January, 1943 by enemy fire near Biserta.